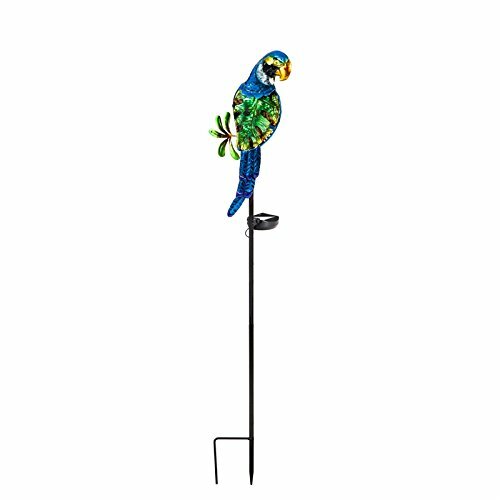 Light the night with this perky parrot solar garden stake. Crafted from metal and glass, the vibrant green-and-blue bird will add the perfect amount of tropical flair to your yard. The stunning design amplifies any space's aesthetic appeal during the day and offers an illuminating ambience throughout the night.Its embedded solar panel collects sunlight to power the piece once darkness falls. It requires 1 AA 1.2V 450mAh battery to operate, which is included. For best results, allow the product to be directly in the sun for at least 8 hours to charge. When fully powered, the parrot's automatic timer keeps the bird glowing for 6 to 8 hours before shutting off for 16 hours. H-stake bottom allows for easy placement. Measures approximately: 7"W x 3"D x 38.25"H.